هدف اصلی این مطالعه بررسی تأثیر تنزل ارزش پول ملی (افزایش نرخ مؤثر واقعی ارز) بر تراز تجاری ایران در چارچوب منحنی‌های J و S طی سال‌های (1386-1355) می‌باشد. در این راستا اثر منحنی J در بلندمدت به روش هم‌انباشتگی جوهانسن - جوسلیوس مورد بررسی قرار گرفته و از توابع عکس‌العمل آنی و منحنی S برای تبیین اثرات کوتاه‌مدت بین تغییرات نرخ مؤثر واقعی ارز و تراز تجاری استفاده شده است. نتایج حاصل از تخمین مدل، بیانگر این است که در بلندمدت نرخ مؤثر واقعی ارز تأثیر منفی و معنی‌دار بر تراز تجاری ایران داشته و تابع عکس‌العمل آنی نیز دلالت بر تأثیر منفی آن در کوتاه‌مدت دارد. همچنین نتایج هر دو رهیافت منحنی J و S نشان می‌دهد که در کوتاه‌مدت، با کاهش ارزش پول داخلی تراز تجاری بدتر شده و در بلندمدت نیز بهبود پیدا نمی‌کند. The main objective of this paper is to investigate the effect of currency devaluation on the trade balance of Iran by using J and S curve approaches over the period of 1976-2007. For this purpose, we used the Johansen’s co-integration approach and impulse response function for the long run and short run analysis, respectively. The empirical results reveal that currency devaluation has a negative effect on the Iranian trade balance in long run as well as short run and reject the J and S curves hypothesis for Iran. Overall the empirical findings of the J and S suggest that the trade balance of Iran does not improve as a result of currency devaluation. برومند جزی، شهزاد؛ کهرام، آزادمهر؛ «اثر کسری بودجه و نرخ ارز بر کسری حساب جاری تراز پرداخت‌های خارجی ایران»، پژوهش‌نامه اقتصادی، 1384؛ شماره 2. شقاقی شهری، وحید؛ «بررسی متغیرهای کلان اقتصادی مؤثر بر کسری حساب جاری ایران»، جستارهای اقتصادی بهار و تابستان 1384؛ شماره 3. 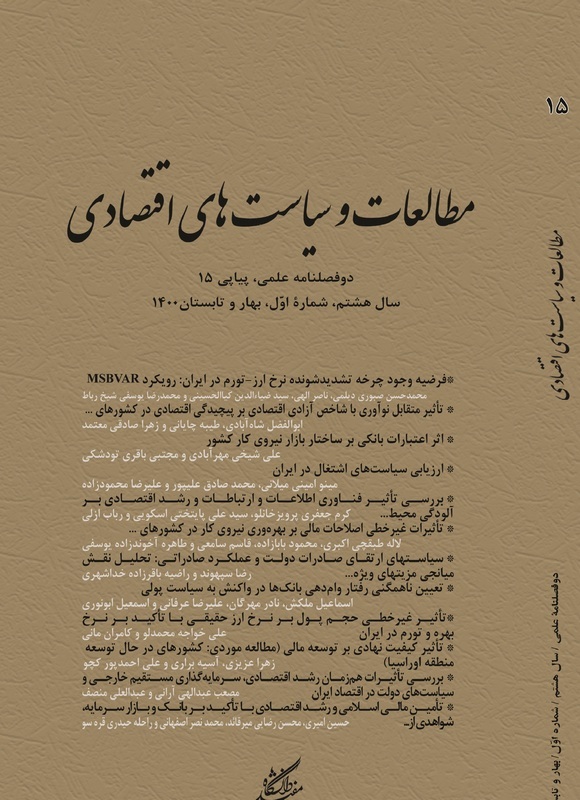 نجارزاده، رضا و دیگران (1388) «تأثیر رابطه مبادله و نرخ ارز واقعی بر کسری بخش تجارت خارجی اقتصاد ایران»، فصل‌نامة پژوهش‌های اقتصادی، 1388، شماره 2. نوفرستی، محمد؛ «ریشه واحد و هم‌جمعی در اقتصادسنجی»، تهران، مؤسسه خدمات فرهنگی رسا، 1378. Ahmed, J; Yang, J; "Estimation of the J-Curve in China", East-West Center Working Papers, 2004, No. 67. Bahmani Oskooee, M; "Devaluation and the J-curve: some evidence from LDCs", The Review of Economics and Statistics, 1985, No. 67. _______________; "Devaluation and the J-curve: some evidence from LDCs", The Review of Economics and Statistics,1985, No. 67. _______________; "Nominal and real effective exchange rates of Middle Eastern countries and their trade performance", Applied Economics, 2001, No. 33. Bahmani oskooee, M; Abera, G; Ratha, A; "S-curve Dynamics of Trade in Africa", African Development Review, 2008, No. 2. Bahmani Oskooee, M; Alse, J; "Short-run versus longrun effects of devaluation:error correction modeling and cointegration", EasternEconomic Journal, 1994,No. 4. Bahmani oskooee, M; Ratha, A; "The J Curve: a Literature Review", Applied Economics, 2004, No. 36. ____________________ ; "Bilateral S-curve between Japan and her trading partners", Japan and the World Economy, 2007, No. 19. ____________________ ; "S-Curve dynamics of trade between U.S. and China", China Economic Review, 2010, No. 21. Brissimis, S. N.; Leventakis, J. A; "The effectiveness of devaluation: a general equilibrium assessment with reference to Greece", Journal of Policy Modelling, 1989, No. 2. Enders, W; "Applied Econometric Time Series", University of Alabama, 2004. Gomes, F.A.R; Paz, S; "Can real exchange rate devaluation improve the trade balance? The 1990-1998 Brazilian case", Applied Economics Letters, 2005,No. 12. Hacker, R. S; Hatemi-J, A; "Is the J-curve effect observable for small North European economies? ", Open Economies Review, 2003, No. 14. Hacker, S; Kim, H; "How Does a Depreciation in the Exchange Rate Affect Trade over Time", Jankoping International Business School, 2010, No. 2.
International Financial Statistics, CD-ROM, (IFS), www.imf.org. Johansen, S; Juselius, K; "Maximum Likelihood Estimated and Inference of Co- integration with Application to the Demand for Money", Oxford Bulletin of Economics and Statistics, 1990,No. 52. Kalyoncu Huseyin, et al; "Devaluation and trade balance in Latin American countries", Zb. rad. Ekon. fak. Rij, 2009, No. 27. Miles, M. A; "The effects of devaluation on the trade balance and the balance of payments: some new results", Journal of Political Economy, 1979,No. 3. Narayan, P.K; "New Zealand’s trade balance: evidence of the J-curve and granger causality", Applied Economics Letters, 2004,No. 11. Rose, A. K; Yellen, J. L; "Is There a J-curve? ",Journal of Monetary Economics, 1989, No. 24. ____________________ ; "Is There a J-curve? ", Journal of Monetary Economics, 1989, No. 24. Sundararajan, S; Bhole, L. M; "Testing the effects of devaluation on the balance of payments in India", Indian Journal of Quantitative Economics, 1988, No. 2. Yiheyis, Z; "The Effects of Devaluation on Aggregate Output: Empirical Evidence from Africa", International Review of Applied Economics, 2006, No. 1. Zhang, Z.Y; Sato, K; "How Effective Is the Renminbi Devaluation O China’s Trade Balance", 18th World IMACS / MODSIM Congress, Cairns, Australia, 2009, No. 5.